Great reliability and low running and repair costs make the VW Golf a very easy car to live with, hence the popularity of this long time favourite. Being such a popular car most reputable service centres will be able to service your car to VW specifications as well as easily source the parts needed for regular maintenance and repairs. The VW Golf has proven such a reliable car that hopefully you wont have too much trouble and it will only visit a garage for a regular service, however no car is perfect throughout your time owning it and any problems should be sorted quickly and easily by a reputable service centre like ourselves to help minimise any expensive repairs which can be caused by poor maintenance. Most reputable service centres may also offer free safety checks for components such as brakes, tyres and fluids which will help identify parts that might be wearing out before they become a problem and create a large repair bill. Another check to consider on older models is the Air Con efficiency as the AC system may need recharging to bring it back up to full capability. 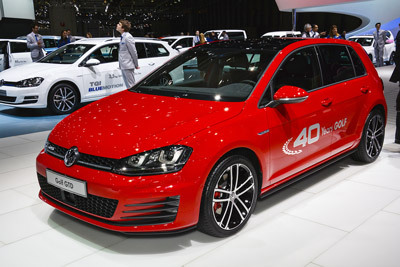 The VW Golf is now in its 40th year and 7th generation with no sign of losing it's popularity. The great thing about the Golf is that even throughout the years its managed to keep its timeless and understated look. The golf has won many awards including Yahoo Car of the year 2015 for the latest mark 7 version, and is a great car designed for all types of drivers. If you're looking for a practical car then the Golf is just that, offering a comfortable drive across the range. Whether you go for the Bluemotion petrol or the TDi diesel engines they are still deemed as a better drive than many rivals and even more expensive cars in the classes above. One of the Golf's biggest strengths is the reliability of the car with few complaints about the Golf its the perfect vehicle for keeping running costs to a minimum. A lot like it's main rival the ford focus, running cost for a VW Golf are very reasonable and with a wide range to choose from there is a VW Golf to suit most budgets. The wide variety of models in the Golf range means thats road tax varies across many tax bands, and insurance is often cheaper than smaller cheaper cars since the introduction of the crash avoidance systems that have been added to the latest models. Overall the Golf is a timeless car that still remains a great value for money.